The Samsung Galaxy Note9 is now official. It wasn't too hard to guess what the next Galaxy Note will be like - it's a bigger Galaxy S9+ with an S-Pen. But that's us oversimplifying it. This phone employs every cutting-edge technology Samsung has right now and builds on the legacy that once ignited the phablet revolution. It's been a while since Samsung improved the S-Pen and that's probably the biggest change since the Note8. Sure, there is a new chipset, an upgraded camera, and a larger battery, but the Note8 is still a beast even a year later. The S-Pen on the other hand, every Note's key feature, was put on hold for a few generations. That changes with the Galaxy Note9. The new S-Pen looks a lot like the old one but has some new eye-catchy color accents. But now it's powered, it connects via Bluetooth, and doubles as a remote control in various use cases. 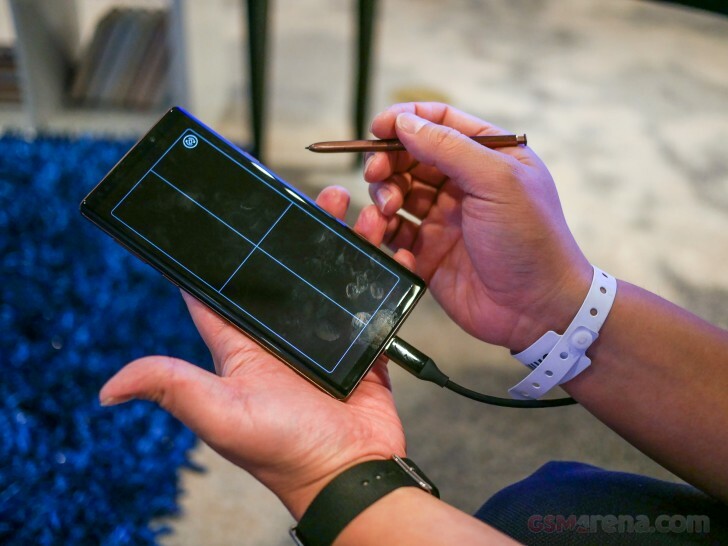 And to make things even sweeter, the Note9 doesn't need a DeX pad for Samsung's Desktop mode, you just need a proper cable. That's certainly one way to reinvent those power-point presentations. The Note9 design hasn't changed much, and it got most of its internals from the Galaxy S9+ - the chipset, the dual-camera with variable aperture, even the selfie snapper. There are more storage and RAM, of course, and a larger battery, but it's the Galaxy you know. Body: Aluminum frame, Gorilla Glass 5 front and back; IP68 certified for water and dust resistance. Midnight Black, Ocean Blue, Metallic Copper, Lavender Purple color schemes. Display: 6.4" Super AMOLED 'Infinity Display', 2,960x1440px resolution, 18.5:9 (2.06:1) aspect ratio, 514ppi; HDR10 compliant (no Dolby Vision). Rear camera: Primary 12MP, Type 1/2.55" sensor, f/1.5-2.4 aperture, 26mm equiv. focal length, dual pixel PDAF, OIS; Secondary 12MP, Type 1/3.4" sensor, f/2.4 aperture, 52mm equiv. focal length, autofocus, OIS; 2x zoom. 2160p/60fps, 1080p/240fps slow motion, 720p/960fps super slow-motion video recording. Memory: 6/8GB of RAM; 128/512GB of storage; microSD slot for cards up to 512GB. Battery: 4,000mAh Li-Po (sealed); Adaptive Fast Charging (same as S7/S8/S9); QuickCharge 2.0 support; WPC(Qi)&PMA wireless charging. Misc: Bluetooth-enabled S-Pen stylus with 4096 pressure levels and multimedia controls; fingerprint/iris/face recognition; stereo speakers tuned by AKG; 3.5mm jack; bundled AKG headphones; DeX dock compatibility. The Galaxy Note9 is jam-packed with features - that's why we love the Notes. It has everything a phablet should have and more. There is no notch on the iconic Super AMOLED screen, thankfully, and it seems Samsung might successfully wait out this trend. And it's probably for the better. 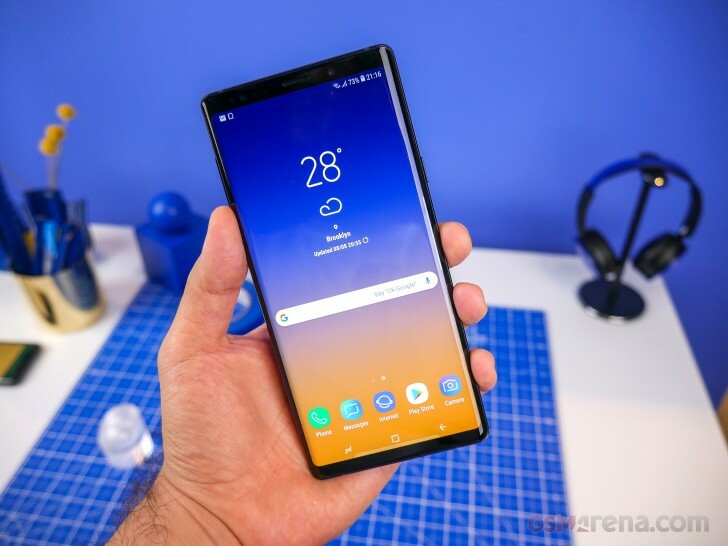 The Note9 is shaping to be the best professional smartphone on the market, and that's not a stretch - the previous Notes have been known for being excellent versatile pros. The only devices to come close to be as professional are LG's V series, though they lack a stylus. But the pen is not dead yet, it was re-imagined so, LG might have to reconsider adding one for the V40. Let's cut to the chase though. We have spent some quality time with the Galaxy Note9 and the impressions are in.